Nicholas Brown, Author at Solar Love! Originally published on Kompulsa (some edits). NV Energy, a Berkshire Hathaway-owned utility company, has signed a PPA to purchase electricity from the 100 MW Playa Solar 2 power plant at a stunningly low price of $0.0387/kWh! CleanTechnica just reported on “the world’s cheapest solar” landing in Austin, Texas, with bids under 4 cents/kWh (and the assumed unsubsidized price of solar thus being below 5.71 cents/kWh), and that was incredible news, but it looks like that staggering news wasn’t even the highlight of the month! Note that 3.87 cents/kWh is approximately 68% cheaper than the national average electricity price. I’s also well below the low levelized cost of electricity of coal, natural gas, or nuclear, according to Lazard. The only electricity generation option that can compete with that is wind energy. Furthermore, it’s much lower than the low of 6 cents/kWh that Lazard was predicting for solar in 2017, even if you add in the expected federal subsidy boost (which brings the price up to 5.53 cents/kWh). Certainly. More sunlight translates to more power per solar panel, resulting in a lower cost per kWh. The growth of the solar industry contributes to the price decline we’ve been seeing over the years. 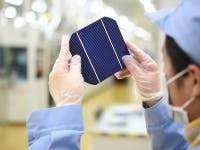 The declining cost of solar PV technology certainly helps too. If solar panels get extremely cheap (and at this rate, that might happen), that makes the idea of purchasing extra solar panels to compensate for cloudy weather (as opposed to energy storage or gas backup) more attractive. Trackside solar panels have the potential to save Network Rail £150 million in energy costs, according to a WSP report. This is particularly beneficial to Network Rail because it could be implemented without using farmland. Installing solar panels on land which you already own is, of course, particularly beneficial because you can avoid the cost of purchasing land for them. “The study focuses on how the land and assets owned by the rail industry – Network Rail owns around 122 hectares in England alone – can worker harder to provide value, by installing trackside solar panels and improving smaller, tier two stations,” a lead-in to the report states. Julie Carrier, the UK head of rail at the WSP, said that they are under a tremendous amount of pressure to make the rail network more financially efficient due to declining public investment and increasing demand. As she said, the solar project could make Network Rail’s land work harder for them. We have seen large solar investments connected to rail lines in India, and on a rail line between Amsterdam and Paris, so why not the UK? WSP is not looking to finance the solar projects themselves due to the large upfront costs, but is aiming to attract investors who would do so, passing on some of the huge financial benefits to WSP while taking some for themselves. We’ll have to wait to see if anyone bites. Yingli Green Energy Holding (otherwise known as ‘Yingli Solar‘) has improved solar panel efficiency using a simple, innovative method. It achieved this by reducing the amount of metal applied to the solar cells so that more of their surface area is exposed to sunlight. This new solar concept is called N-type Metal-Wrap-Through technology (N-MWT), and Yingli Green Energy has commenced trial production of it using technology developed by Formula E (or Formula E s.r.l.) which also reduces power loss during module encapsulation. The equipment has been installed in one of Yingli’s module workshops. ‘The Formula E team worked tirelessly to put in place a pilot production line that enables the automated manufacturing of different module architectures, delivering unprecedented reliability, accuracy and precision in the manufacturing of MWT modules. Our collaboration with Yingli Solar is definitely strategic for our growth. We believe a new age for PV industry is now open and promises very appealing results for end users,’ commented Davide Spotti, the president of Formula E.
The Georgia Public Service Commission (PSC) has approved a new program under which the local energy generator and distributor Georgia Power would be required to construct 525 MW of solar power plants by 2016. This was proposed by Lauren McDonald and was passed with a vote of 3-2. Incidentally, a lot of support came from the local Tea Party. Dooley said the Tea Party believes consumers should be able to exercise choice when it comes to their energy source and the activists she works with don’t want to be dependent on one or two energy sources. And Dooley’s effort is not aimed at reducing carbon emissions — in fact, she doesn’t believe in global warming — but based on their view that solar is a commonsense alternative for Georgia ratepayers that could function without subsidies. For more background, read the full Climate Progress article. The ruling is the latest event in what has been a loud, two-year fight. But what makes Georgia’s solar fight different is that solar advocates aren’t just selling solar as a way to reduce emissions or reduce fossil fuels. Solar has been positioned as a property rights issue pitting private citizens against utilities, regulators and fixed rates of return. If the strategy continues to work, it could become a template for the advocates in rest of the country. Call it the “the enemy of my enemy is my utility” battle plan. Following that, Forbes also has more context that is quite interesting and worth a read. Solar Love founder and CleanTechnica director Zachary Shahan was also recently contacted (in mid-June) by an insider working with conservative politicians in Georgia who were pushing for this Georgia solar power boost. It was conveyed to him that it was hoped this effort would bring more Tea Party and Republican leaders over to the solar energy camp. Clearly, their voters support solar energy development, more than any other energy source, as poll after poll shows. Current techniques such as tax rebates do appear to have stimulated the solar industry. However, the urgency of climate change, as well as widespread carbon monoxide and sulfur dioxide pollution, require the quickest solution possible. There are various ways in which solar system development can be stimulated more quickly. One policy idea of mine is discussed below, followed by a simple consumer idea.